Thursday, May 22, 1952, the St Louis Cardinals at the Polo Grounds, no score, bottom of the 2nd inning, one away, and Willie Mays barrels into home on a thrilling, bang-bang play as catcher Del Rice looks to deny the young Giants’ speedster the plate, with umpire Al Barlick, with cap askew from hurriedly ripping off his mask, ready to call it. Mays, on third after a triple, broke for home on an Alvin Dark grounder to short. 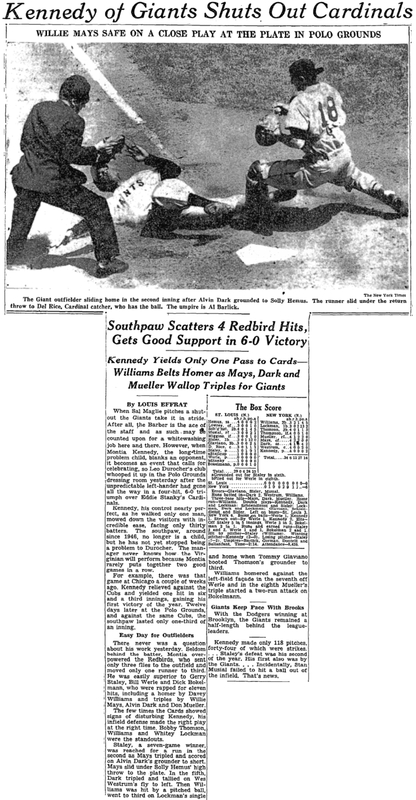 The Cardinals’ SS Solly Hemus fired it home but the throw was high, and Mays slid in under the tag to score the first tally of the game, and the Giants would go on to win it on a 6-0 4-hit shutout from Montia (Monty) Kennedy, to keep pace with first place Brooklyn by remaining only 1/2 game out. From the New York Times, another photo of the same play but from a different photographer (slightly different angle) and the account of the game. For Mays, in his second season, and first season going north with the club out of spring training (and still less than a year from the date of his 1951 debut), this would indeed be a fleeting moment, at least for a while. Less than a week after this contest (only 5 games later), and the surging defending NL Champs on a 7-game winning streak to move to 2 1/2 games in first, with draft notice in hand he’d depart for service in the U.S. Army, effectively dousing the Giants’ pennant hopes, who lost 8 of 10 games after his departure and were never quite able to overtake the Dodgers in 1952. 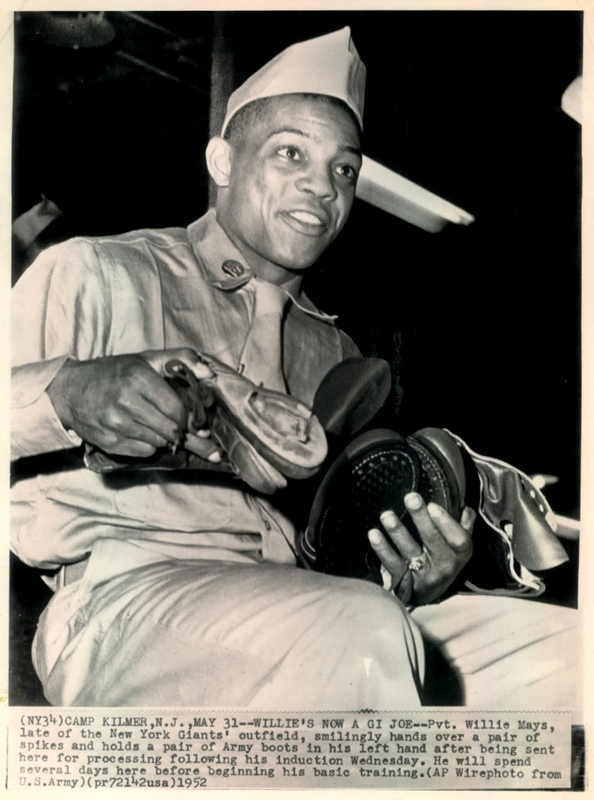 After playing approximately 180 games while in the Army (and perfecting his signature “basket catch” along the way), Mays would not return to the majors until 1954, when he would begin his legendary career in earnest, topping the majors in BA (.345) and slugging (.667) to earn NL MVP honors and the first of 23 straight All-Star Game appearances, as the Giants won the 1954 title, with a big assist from Willie and his legendary catch at the Polo Grounds in Game 1 (“The Catch”, below). For the uninitiated, check out more stats near the end of this post and also my Pastime Portraiture post for more on the incomparable “Say Hey” Kid. Del Rice, at the receiving end of the pair of spikes in our featured photo, was the right man for the job – although being a less-than-accomplished offensive player, Rice, in his 8th season for the Cardinals (and third as the primary backstop), was considered one of the league’s premier defensive catchers. Flashing a strong arm in his youth and tall for a catcher, he was discovered and signed by then-Cardinals GM Branch Rickey’s brother Frank, one of the top scouts in the St Louis organization, in 1941. A stint in the Armed Forces by another major leaguer, the Cardinals starting catcher, Walker Cooper, in April 1945, would allow Rice to come up to the majors as a backup, where he quickly established himself as both a manager’s and fan’s favorite behind the dish. 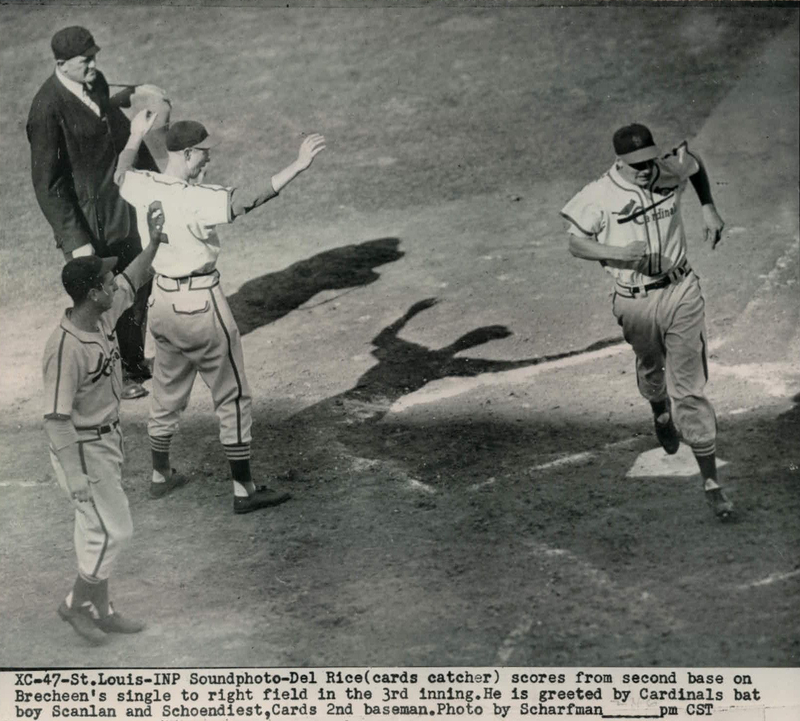 And light-hitting Del would step up to the plate in Game 2 of the 1946 World Series, going 2-2 with a double and scoring 2 for a 3-0 victory over Boston at Sportsman’s Park (photo below). 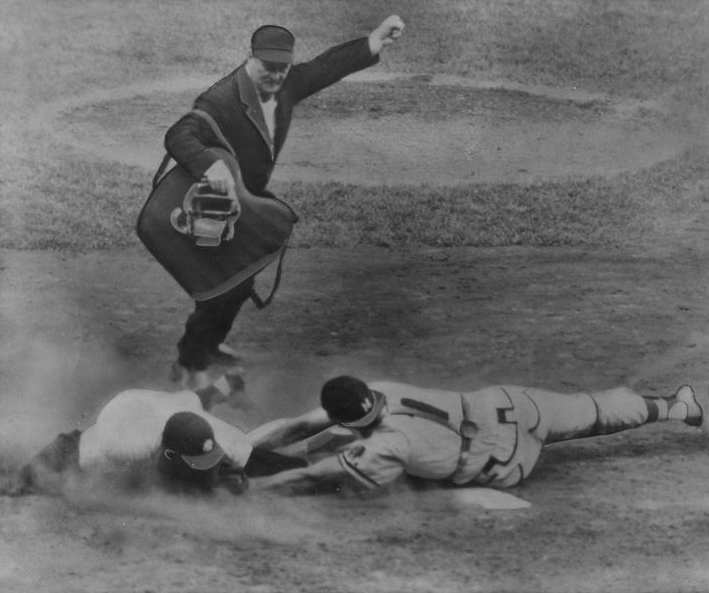 And being the personal catcher of #2 starter Harry Brecheen, Rice would catch in 3 games in the Series, including a complete game effort in Game 6 and closing out Game 7 with a 4-3 victory as the Cardinals beat the Red Sox in 7 games for the 1946 title. 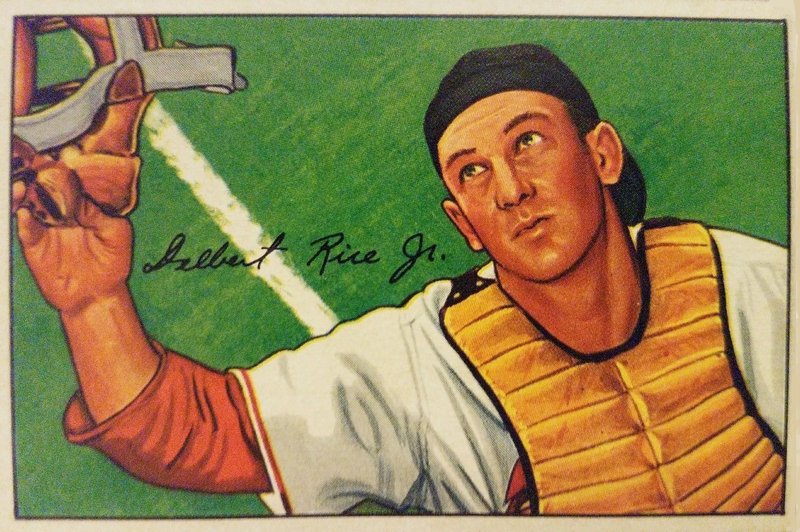 Starting in 1947, Rice would catch the majority of the Cardinals’ games going forward, helping St. Louis to a league-best team ERA in 1947 and again in 1949, and himself leading all NL catchers in fielding percentage in both 1948 and 1949. And 1952 (the year of our featured photo) would find Del having his best offensive season, with an 11/65/.259 line with 27 doubles, which would carry over into 1953 as he earned his only All-Star Game selection (although he was injured and did not play). Interestingly, during his Cardinal days, he also happened to have a professional basketball career, playing for the Rochester Royals of the old National Basketball League from 1946-1950, until the Cardinals suggested he stick to baseball (imagine a major league catcher doing so today!). With injuries and being a long-time starting catcher taking their toll into the mid-1950’s, Rice was traded to the Milwaukee Braves in 1955, and, while relegated to part-time status, did participate in two more World Series, getting a second career championship ring in 1957 as they defeated the New York Yankees in 7 games. 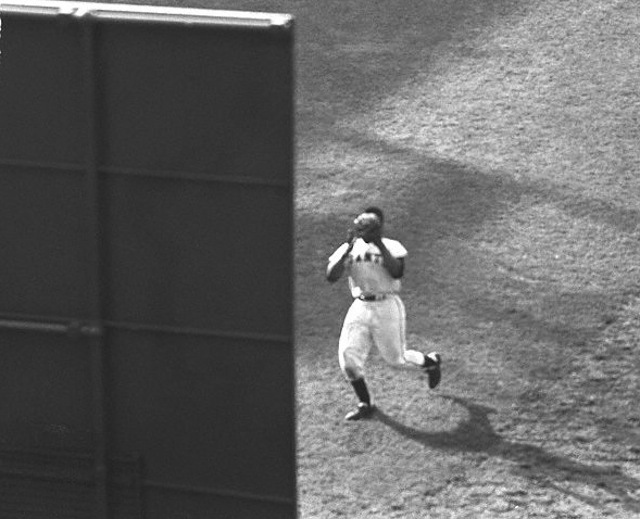 1957 World Series, Game 6, Yankee Stadium: Del Rice nails Yogi Berra at the plate in the bottom of the 8th inning to keep the score 3-2 Yanks. Umpire Jocko Conlon has the call. Yanks would prevail to even the Series but Braves would win Game 7 in New York to take the championship. 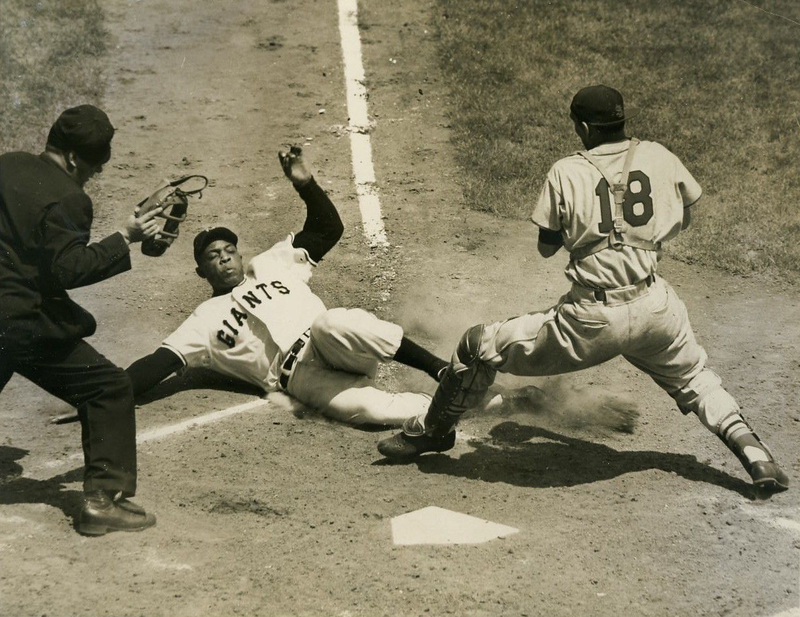 Unfortunately, another encounter at home plate with Willie Mays would prove costly to Del Rice; on June 1, 1959, at County Stadium in Milwaukee in the top of the 8th with the score already 7-2 Giants, the now San-Francisco-Giant Mays was looking to score from first on a Orlando Cepeda double, with Rice again looking to deny the run. Mays was again successful but at the cost of a fractured left leg for Rice, who was carried off on a stretcher and would miss two months of the season. Only used sparingly thereafter, he was moved to a coach’s position, then released at season’s end. He’d play a few more games for various teams, and ended up as the very first player chosen by the expansion Los Angeles Angels, finishing his playing career as a player-coach. He’d be retained by the Angels as a coach and would continue on in various coaching, managing and scouting positions for many years. Willie Mays, of course, would go on to be one of the greatest players in the history of the sport, and how about more eye-popping stats to prove it – he’s top ten all time in many offensive categories, including 660 HRs (5th all time), 6,066 Total Bases (3rd all time), 1,323 Extra Base Hits (5th all time) and 2,062 Runs Scored (7th all time). And if you want to include the modern-day sabermetric WAR (Wins Above Replacement) for position players, career, where does Mays rank? How about 3rd all time (156.4). 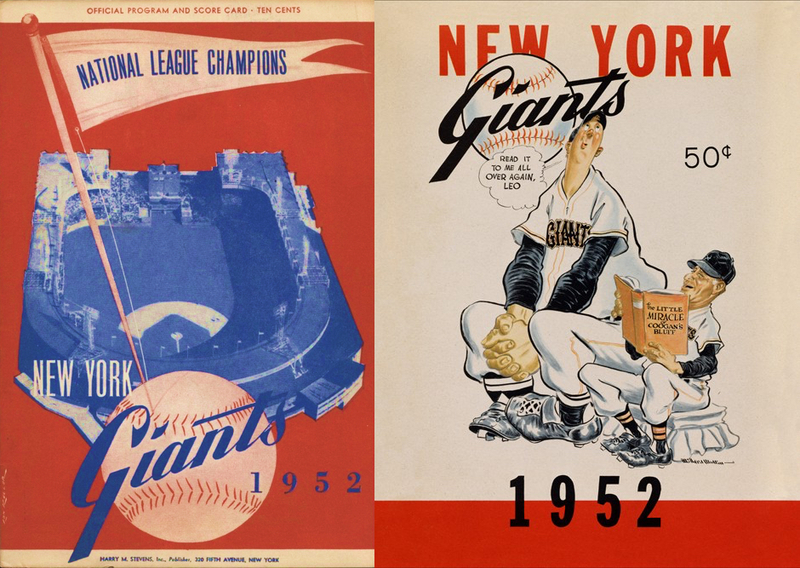 But back in May 1952, Willie Mays was the one with an uncertain future, and Del Rice the established veteran, but still neither could begin to guess what lay ahead – moves to cities that had yet to have MLB franchises, winning pennants and championships for ball clubs that really had yet to exist, and being unable to play due to circumstances beyond their control, be it in the service of their country, or in the event of sudden injury. Either way, with the click of a camera, we can celebrate another Moment in Time now long gone. 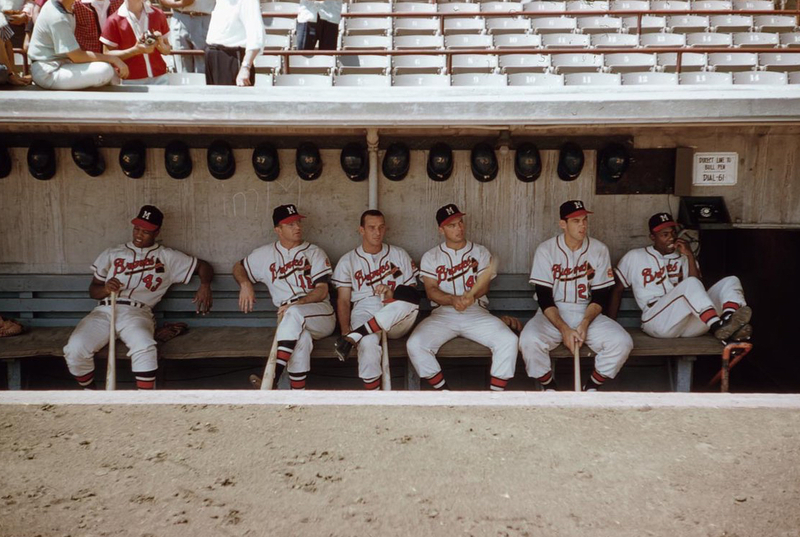 Click here or at the top of this page for more great classic baseball photos and stories! And don’t forget to follow us on Twitter!